I’ve mentioned Game Center CX more than a few times in my writing, and for good reason – it’s a fantastic show that everyone who enjoys older games will appreciate. But while the most popular segment of the program among most fans is the Arino’s Challenge portions, I personally enjoy the “Tama-ge” bits a lot more. In these parts of the show, Arino travels to visit various arcades, large and small, across Japan. It’s a wonderful combination of travelogue and nostalgia, showcasing the (sometimes very odd) places where arcades turn up, the games and atmosphere that make that particular arcade experience interesting, and the people who maintain these game centers. It’s both inspiring and a bit depressing, as the number of mom-and-pop arcades in Japan has been plummeting over the last decade. Oftentimes, it feels like Arino’s travels are an attempt to encourage people to help preserve a dying cultural institution (the segment’s title means “You should visit this game center sometime”). When I was a teenager, I used to love doing what Arino did during my family’s trips across the country – looking up arcades in the area, visiting them, and seeing what they had to offer. (I was especially devoted to this when Virtua Fighter 3 was really, really hard to find in North America outside certain urban areas – my hunts were often targeted towards finding that particular game.) Nowadays, this is hard to do, because the state of Western arcades is utterly miserable. Most arcades these days – the ones that are still around, anyway – are parts of massive “entertainment centers” that make far more off of redemption games than dedicated video cabinets, and what they do have for games is often old and suffering from disrepair. 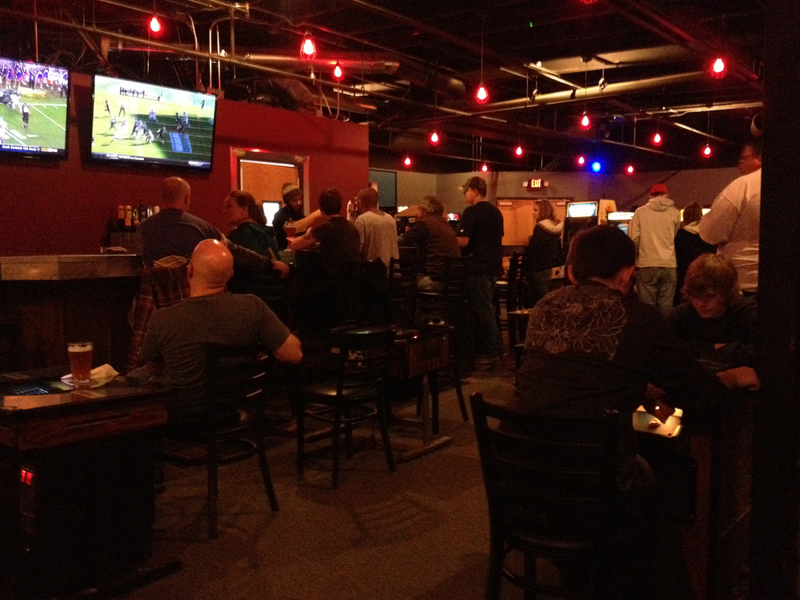 But there are enthusiasts out there trying to find ways to preserve the more traditional, video-game-focused arcade experience: one of the more popular modern concepts is the “barcade,” a combination of pub/eatery and retrogaming arcade catering to an older clientele. Generally, most of my experiences with said “barcades”1 have been kinda blah – the alcohol part doesn’t do much for me since I’m one of those irritating teetotalers, and the game selection is generally pretty similar across many of these establishments: Pac-Man and Ms. Pac-Man, Galaga, a bunch of Donkey Kongs, some Space Invaders, probably a Tapper or two to fit the bar theme, Robotron 2064, and a Street Fighter or Mortal Kombat to get some 90s kid cred. These are good and all, but they’re also pretty easy to find. What I’m interested in are titles that you don’t see everyday, particularly Japanese games from the mid-late 80s – stuff that came out after the crash-correction of the Western video game market in the earlier part of the decade and is considerably less common as a result. I discovered one such arcade on a recent trip. While I spent most of my life in Iowa, my parents retired to the Boise area in Idaho a couple years ago, so I went to visit my parents there over Mother’s Day weekend. My dad suggested stopping by a few arcades while I was there, and one of them was a place called the Grinkers Grand Palace in the Boise suburb of Eagle. It’s nestled into a corner of a strip-shopping center that doesn’t look like the kind of place that would host a bar-arcade. When I stepped inside, however, I knew I had found someplace very special. So today, I’m going to imitate our beloved Kacho Arino and tell you: you should go to Grinkers sometime! The moment you step foot into Grinkers, you’re in a place that feels like Western arcades of old – dimly-lit, abuzz with electronics, and featuring rows rows of bright cabinets, their CRTs arranged to guide you through the facility. (Assuming you don’t stop to play them, of course.) Towards the back is a bar and counter where a few TVs play whatever sportsball is happening at the moment: you can sit there and watch (if you’re over 21 – you’ll need to show ID to stay at the bar area) or you can relax at one of the smaller tables or cocktail cabinets at the side. There’s a menu that serves a lot of specialty sub sandwiches, though if you just want some cola and a bag of chips you can get those easily as well. That’s all well and good, but what made Grinkers so great was the game selection. You’ve got pretty much all the arcade-classic standards here, along with a whole mess of machines that are far less common to come across. Some of these are practically “holy grail” status to find. Let’s take a look at some of my favorites! Phoenix is a not-terribly-common Konami/Centuri Space-Invaders-like, while Rastan is a Taito-made, Conan the Barbarian-inspired action/platformer with an incredible soundtrack by Zuntata’s MAR. Game’s pretty damn solid, too! Not one you see too often, but a very cool (and very fun) game to find. Did I mention you can properly hear the music on all of these games? It’s pretty great. Makaimura madness! Both arcade installments of Capcom’s much-beloved, painfully difficult platformer series are playable here. Impress your friends with a one-credit clear! …Unless, of course, your friends are jerks who can’t appreciate your amazing retrogaming accomplishments and want to play on their own. A couple of evergreen four-player Konami beat-em-ups ought to keep those who don’t quite love the more obscure retrogames as much as we do occupied. Burgertime is fairly common in these types of arcades, 10 Yard Fight and Elevator Action less so. I forgot how weird the “enter the door” movement/collision area was in the original EA. A lot of folks don’t know that R-Type was actually distributed by Nintendo in North America! Pretty odd, especially since this was around the time they were starting to drastically shift focus to the home market. It’s a nice-looking cabinet, too. Speaking of Nintendo, I don’t think I’ve seen that two-sided VS cabinet in something like 25 years. They have the dual-screen Punch-Out!! as well, though I didn’t grab a photo. Xevious is a pretty tough one to find Stateside – while the game was massively influential in Japan, it really didn’t make waves here at all. Very cool to find one here! (There’s a Bosconian as well, making Grinkers a go-to for your early Namco arcade history needs.) Choplifter is also a very nice addition. I love that original “kaleidoscope” Universal cabinet for Mr. Do!. Warp & Warp is one you don’t see too often and another very early Namco title. It’s not a particularly good one, but it’s interesting at least – I’m pretty sure that the “maze” portion of the game helped inspire Bomberman down the line. Now here’s a rarity! Working Baby Pac-Mans aren’t easy to find, simply because the game’s combination of arcade game/pinball machine means it requires extra, very specialized upkeep. This is one of the nicest-condition Baby Pac-Mans I’ve yet seen – even the ones I’ve seen brought to California Extreme don’t look this good. Of course, that doesn’t really make the game any better – Baby Pac-Man is a unique mix of an awful Pac-Man game with a hideously dull and comically undersized pinball table. You’re actually not given any power pellets in-game – you have to drop out of the maze and play the pinball portion to earn them – so if you’ve bad at the pinball portion (or just completely bored by it), you’re basically completely screwed in the main game. It’s an interesting idea that completely fails, but it’s worth playing at least once for that reason alone. Golden Axe needs little introduction (It’s just awesome), Qix pioneered a subgenre of action-puzzle games (that would become primarily pornographic, but that’s another story – and no, there’s no “adult” arcade games at Grinkers), and Journey is forever the epic adventure to avoid crazed alien Groupoids by controlling Steve Perry’s monochrome digitized head. Space Harrier! And early SNK classic Ikari Warriors! Always a good time with both of these. The pictures on Grinkers’s official site show an After Burner as well, but I couldn’t find it there. Oh well, Space Harrier is plenty awesome on its own! You’re doing great! I honestly can’t recall the last time I’ve seen a Rampart. I don’t think it’s horribly uncommon, but I’ve not seen one operational in decades. Anyway, it’s here and it’s in fine shape! This was the real gem of Grinkers, in my opinion – an original triple-screen Darius cabinet. I hadn’t seen one of these since a trip to Japan about 9 years ago, and it cemented this establishment as a must-visit for retro gaming fans in the area in my eyes. Granted, the cabinet wasn’t perfect – the second stick had some issues with the diagonals, and what looked like a wonky connection with the middle screen causes some minor graphical glitching – but if you’ve never played this game on a real cabinet (or haven’t played it for a long time) you’re in for a treat. While the original Darius isn’t the most complex shooter – you have a shot and vertical missles, and not even a smart bomb – it has a sense of grandness and atmosphere that remains impressive to this day. Taito really put the sense of field and space the triple screens afforded to good use with big, detailed backgrounds, challenging enemy waves, and boss fights that have a great sense of scope with your tiny little Silver Hawk in a massive field fighting big, terrifying electro-aquatic monstrosities. Adding to everything is the groundbreaking soundtrack by OGR – revolutionary in its day and still nothing short of an absolute joy to hear in context. The feeling of playing this on the original cabinet is truly unique, as the game basically envelops you with its visuals and soundtrack (provided it’s at the right volume, which it thankfully was!). I daresay it’s worth the trip to Grinkers for this alone. So yes, Grinkers has an amazing selection of classic arcade (and pinball!) games, many of which I didn’t even show here! It’s a shining example of a great retrogaming preserve and a great bar-arcade combination. Most of the machines are very well maintained (I did see a few that looked just a bit off), and you’re pretty much guaranteed to find something that will make you go “HOLY CRAP YES I CAN’T BELIEVE THIS IS HERE.” There are a few omissions that I find puzzling, though – the complete lack of Neo Geo games, and no Strider, Final Fight, or Bubble Bobble in particular. (No Daytona USA also seems odd – I know it’s considerably more modern than most of the other stuff here, but you really can’t top it for bar funtimes.) Still, if you’re in the area and you care about this sort of thing then you absolutely should visit. It’s a great place that I look forward to patronizing again on family visits. If only I could find something this cool closer to home… well, I still haven’t visited the Brewcade yet. Hmmm! A real, live Darius cab would be great to play. I’m not sure that’s ever shown up at MAGFest, but I’d love to be there (or at Grinkers) playing it! I’m surprised you didn’t mention Grinkers incredibly rare sit down Missile Command cabinet. Wow a damned good collection of machines! And I think maybe Pac Man just doesn’t make for good tables. A flea market had a rather worn normal Pac Man pin I tried out yesterday. I was not exactly thrilled. Maybe if better pin designers worked on them?